This 2 in 1 model kit set from Bandai is perfect for those pokefans who can't decide which is the best Mega Evolution of Charizard! This kit includes all you need to make both Mega Charizard X and Mega Charizard Y. This 2 in 1 model kit set from Bandai is perfect for those pokefans who can't decide which is the best Mega Evolution of Charizard! This kit includes all you need to make both Mega Charizard X and Mega Charizard Y. These articulated Charizard figures are constructed using the super effective glue-less clip together method commonly seen in Gundam/Gunpla model kits. 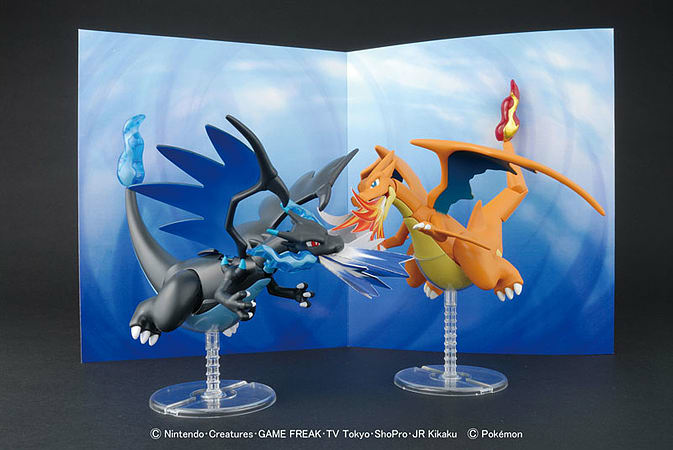 Included with these models are a display stands, stickers, a papercraft background display and 4 types of papercraft flame effects so you can make your Pokemon battle look even more realistic!